(CBS) What's the secret to avoiding skin cancer? There's no surefire strategy, but experts say it's vital to avoid tanning booths and to minimize your exposure to harsh sunlight (with sunscreen, wraparound sunglasses, protective clothing, etc.). In addition, periodically checking your skin can help you spot skin cancer at its earliest stages - when treatment is most likely to be effective. The Skin Cancer Foundation recommends monthly self-exams in which you check all of your skin, including between your fingers and toes, on your scalp, on your back and buttocks, etc. D is for diameter - a mole that spans more than 6 mm (about the size of a pencil eraser - is more likely to be a melanoma. Even if you can recite the skin cancer ABCD's, it's helpful to be able to eyeball photos of the various forms skin cancers and "precancers" can take. Here's our quick-read photo guide. Actinic keratoses: These precancerous lesions (like the ones shown above on the back of a hand) can turn cancerous. They're common in older golfers and others who have spent a lot of time in sunlight. Basal cell carcinomas: This lesion might look like a hive or pimple, but it's actually a basal cell carcinoma. This form of skin cancer is considered less serious than others but should be removed anyway. Melanomas. 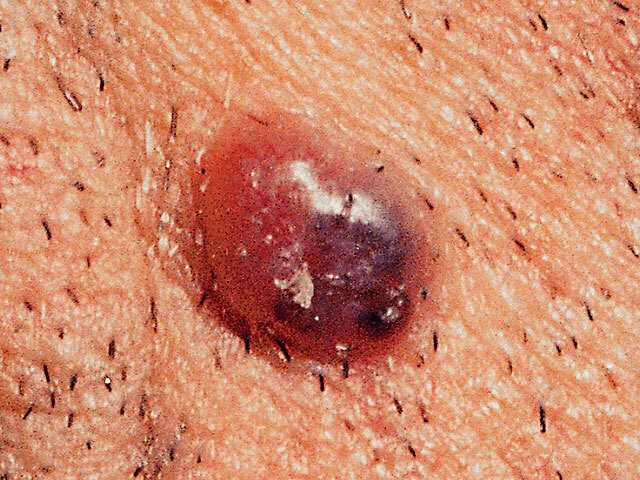 The deadliest form of skin cancer, melanoma (like the one shown above) is characterized by dark pigmentation, often with different shades of color, and irregular, asymmetric shapes. Click below for the next 35 slides.